What is Osteo Bi-Flex Advanced Triple Strength? Osteo Bi-Flex Advanced Triple Strength is a joint supplement manufactured by Rexall-Sundown Inc. Two tablets are consumed daily. Has chondroitin sulfate and boron. Also has MSM, and hyaluronic acid. Has 100mg of 5-LOXIN which was the lower dosage studied in this study. Osteo Bi-Flex Advanced Triple Strength contains titanium dioxide coloring. Chondroitin Sulfate Also has chondroitin sulfate as a part of their 1350mg mixture. Chondroitin makes up glycosaminoglycans which are a component of cartilage. Avocado Soy Unsaponfiables (ASU) Doesn’t have ASU, one of the proven treatments for arthritis. ASUs are commonly prescribed in France for the treatment of arthritis. Methylsulfonylmethane (MSM) Has MSM as a part of their 1350mg mixture. MSM is a vital source of sulfur for protein and connective tissue synthesis. Boswellia serrata Has 100mg of 5-LOXIN as well as an undisclosed amount of Boswellia serrata resin. 5-LOXIN is an extract of acetyl-keto-beta-boswellic acid (AKBA), a potent anti-inflammatory in Boswellia serrata. Cetyl Myristoleate (CMO) Does not have cetyl myristoleate. Cetyl myristoleate is a compound found in the joints of arthritis-resistant mice. Hyaluronic Acid Has hyaluronic acid as a part of a 1350mg mixture. Hyaluronic acid is a vital fluid found in the synovial (joint-lubricating) fluid. Thank you for the information! I have recently begun taking Osteo-Biflex, and wanted more information before recommending it to my 92 year-old father! I am using Ostio Bip Flex now. Do not seem to get benifits from use. Should I increase the amount of dosage? 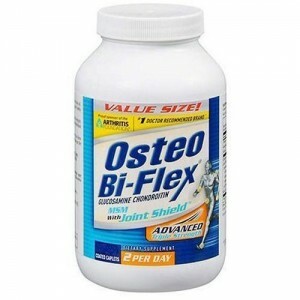 I just purchased Osteo Bi-Flex with 5-Loxin – – and what terrible packaging you have chosen!! The plastic container is at least twice the size needed for the caplets, a really bad choice for our environment. Can you use this if you have artifical knees.? What do you recommend in place of Osteo Bi-flex? I was told to take this from my doctor, but I really can’t tell any change. I agree that your packaging could be much smaller, product fills less than half, waste of money and less environmentally friendly..
My husband began taking two Osteo-Biflex 5 Loxin per day in October. Said he felt great as far as mobility of shoulders. He slowly began itching and developed a rash. Finally after 6 months of use had to see a doctor and a dermatologist and has been on creams, a cortisone shot and more cortisone cream, to relieve the itch and burning. After treatment, in about two days the rash and itching begin again. I really believe it is something in this formula. He did cut back to one per day and his skin is less itchy. Just a warning to others about a reaction that can occur. We don’t have firm conclusions, but I really believe we have hit the nail on the head. We need to find another alternative. Hi, some of these products could cause a reaction because of the glucosamine which some people are allergic to. Seek another alternative supplement. What would you recommend in place of the Osteo Bi-flex? This product was recommended by a family member, who swore on this product. I purchased the product and my god it did help. I have Ben using it since Sundayand. This is Thursday. I have been in so much pain due to the osteo artherities in my knee that I had to go on tempoary disability. Now, I see the results of the study this site mentioned,and don’t know what to do now? What do you recommend? I also took Osteo Bi-Flex for almost two months. Then I tried CosaminDS and within three days I noticed an improvment. My results seems to follows other reviewer here. Not sure why you gave 1 star for CosaminDS and 3 stars for Osteo-biflex. I have been using Ostio Bi Flex for over 3 months now with unbelievable results. I had extremely excrusiating lower back pain and have no insurance to cover an expensive x-ray, I began using Ostio Bi Flex and noticed within 2 days a decrease in arthritis pain. Now I literally have no pain in my knees and ankles and my back is 99% pain free. Titanium dioxide experiments were done on rats as an inhalent in massive doses over a year, it has been taken way out of proportion and has not been clinically proven to be harmfull to humans, I highly recommend Ostio Bi Flex. Have been using caplets for about to weeks, have noticed no change. Was wondering about the really bad smell, like moth balls. the pain in my fingers was excruciating and within 5 days of starting the osteo-biflex i felt relief. i have been using it for 11 days now and the difference is unbelievable. if you wanted to call the pain an 8 before, i would say it is a 2 now and getting better every day. As I’ve aged (62) my 44-year-old motorcycle kneee has become more arthritic, including pain and lameness, esp. when weather changes. Found Osteo-Biflex relieves the pain, eliminates the lamesness. When I run out of O/B, the pain and lameness return – until I resume taking O/B. Long story short, seems to work well for me. What a deceptive packaging. Why the waste? Wrong for the environment. I don’t like the fact that titanium dioxide is used. I have a shoulder problem. I have taken Osteo Bi-Flex for 2 weeks with no results so far. The shoulder problem has been going on for over one year. I have good times and painful times, with or without medication. It has more to do with the kind of exercises I do. Ice seems to be a great medication! I have been using this for going on three weeks. It has absolutely helped me. I didn’t expect it to so it is a great surprise. I had toe, hand, back, knee and hip pain for many years. It has gotten worse over the last year so I decided to try this. My toes, hands and back are great now! I still have some hip and knee pain but it is very tolerable and has been helped so much by Osteo biflex. Can you take this if you are allergic to sulfa?